It is such an exciting time to live in Oregon for people of conscience. We have the opportunity in this year’s legislative session to commit to the funding that will make real improvement in our children’s education, to dramatically reduce a heinously punitive criminal justice system for our youth and to make the death penalty so rare as to almost abolish it. We invite you to contact your lawmakers about funding our education system and to rally here in Portland to show Salem that we mean business! While on the phone about that funding, we urge you to speak with your legislators about the two criminal justice issues outlined below. Lastly we urge those of you who have citizenship/documentation to please leave comments on a heinous new form being proposed by USCIS by the April 16th deadline! See you on Wednesday the 10th at Pioneer Square and next week at our interfaith service on Tuesday the 16th from 7-8 pm at Grant Park Church, 2728 NE 34th. Together we will call in the holy energies of liberation, renewal and rebirth and atonement. Support Fully-Funded Schools for Oregon Students! Join educators, parents and students from across the Portland-metro area in this regional action! Wear red and ride the MAX to Pioneer Courthouse Square by 5pm. 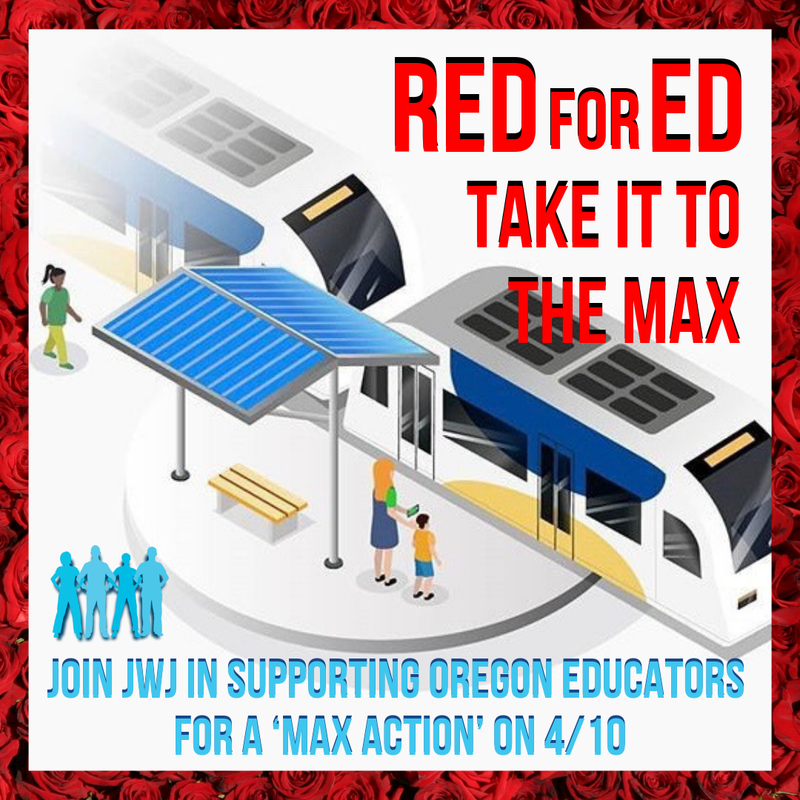 Join us in “Portland’s living room” and demonstrate support of public education! Click here to RSVP on the Facebook Event! Lift a Moral Voice to Support Bold Solutions and Investment in Oregon’s Future! This is our shot to fix our broken tax system and make game-changing, equitable investments in education. Let us commit to making this year one where our legislature will seriously address rampant inequity, and be bold in putting forward solutions to provide a just future for every Oregonian. The legislature’s Joint Committee on Student Success has been doing the important work of finding the right corporate tax to support Oregon students. Click here to urge lawmakers in the committee to push for investments that will benefit our classrooms. 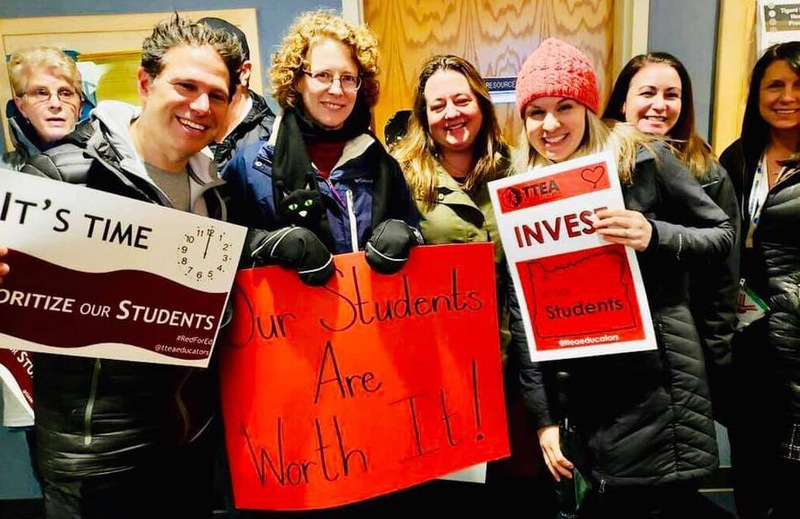 By coming together and asking corporations to pay a modest increase in corporate taxes, our lawmakers can make dedicated investments in Oregon schools, and set students up to succeed inside and outside of the classroom! Help Heal Oregon with Restorative Justice after Decades of Harm from Punitive Law! If you haven’t yet, please read a report from last year titled Youth and Measure 11 in Oregon: Impacts of Mandatory Minimums. The report explains how brain development in youth continues well into one’s twenties, about the disproportionate impact Measure 11 is having on youth of color, and about how legal developments in youth sentencing elsewhere leave Oregon trailing behind. Click Here to learn more about these issues! With that in mind, we support the Oregon Justice Resource Center efforts to update youth sentencing laws to take proper account of current understanding of science and the evolving legal landscape nationally. SB 966 Lets judges decide whether young people “aging out” of Oregon Youth Authority custody at 25 who will complete their sentence by their 27th birthday should serve the rest of their sentence under community supervision rather than in adult prison. SB 968 Ends life without parole sentences for people convicted when under 18 by providing a meaningful opportunity for release after 15 years of incarceration. SB 969 Gives power back to judges to decide whether under-18s should be tried as youth or adults. Ends the automatic waiver into adult court of 15-17-year-olds charged with Measure 11 crimes. SB 1008 Gives all youth convicted in adult court a “second look” hearing halfway through their sentence so judges can determine whether they’ve been rehabilitated and should serve the rest of their sentence under community supervision. We support an end to the death penalty. The reforms currently being considered in Salem would not end the death penalty but would narrow its use considerably. For this reason, we support SB 1013! Through the Oregon constitution, the people granted legislators the power to define which actions constitute aggravated murder and therefore may be liable for the death penalty. Lawmakers are not exceeding their powers when they seek to narrow the use of the death penalty. After decades of dysfunction, it’s time to curb the uncertainty this broken system creates. SB 1013 redefines the crime of aggravated murder by greatly reducing the list of factors considered aggravating. It requires that jurors find in favor of a death sentence “beyond a reasonable doubt.” It removes a question asking jurors to speculate about “future dangerousness” when deciding a sentence. Be Vocal in Opposition to USCIS’s New “Tip Form” Before April 16th! This form would exposes Oregon’s immigrant community to further profiling and is ripe for abuse by anti-immigrant bigots. There are only a few dozen comments on the proposal so far. Help us make a strong showing from Oregon’s immigrant advocacy community and oppose the form via public comments. Below is more information from CLINIC, and some resources including a model comment. When pro-immigrant voices united in Oregon, we turned out over 3,000 comments opposing last year’s harmful proposed changes around ‘public-charge’! We can do this, but we have mere days!